Reports held by the Boulder County Sheriff’s Office may be obtained from the Records Section. We will need to have a written request for this information and have forms available at our office to fill out or print our records Request Form. You will need to fax, mail, or bring the filled out form to our office. Reports can be emailed, mailed or picked up when ready. If you wish to pay by credit card, the service is provided by a 3rd party vendor, Colorado.gov. There will be a $0.75 base charge, plus an additional 2.25% for all payments made by credit cards to help develop, enhance and maintain the service. You may use our form, or a letter of your own which includes a written statement saying the information will not be used for the solicitation of business for (monetary) pecuniary gain. Colorado law 24-72-305.5 requires us to obtain this signed statement prior to releasing reports. Please allow processing time for requests. Effective October 1, 2018, the Boulder County Sheriff’s Office will no longer be able to accommodate public fingerprinting. The Colorado Bureau of Investigation (CBI) is in the process of implementing a new, Statewide Digital Fingerprinting Process known as CABS (Colorado Applicant Background Services) in response to Senate Bill 17-189. The CBI recently awarded two contracts allowing third party vendors to print and submit non-criminal applicant fingerprints for the State. These vendor services will be located throughout the State, increasing applicants’ ability to obtain fingerprints in a timely manner. These services will also reduce the burden on Law Enforcement agencies as the vendors will electronically transmit the civil fingerprints. The processing time and rejections will decrease tremendously. This program is tentatively scheduled to start implementation on Monday September 24, 2018. We are providing the below links to additional information for citizens who may have questions regarding the new process and where to go for fingerprinting. For more information on the new process for public fingerprinting, view our most recent press release. The Boulder County Sheriff’s Office registers convicted sexual offenders who reside in the towns of Lyons and Superior and unincorporated Boulder County, in accordance with state law. Sexual offenders are required to register quarterly, or annually, depending on the crime for which they were convicted. 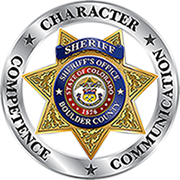 A list of sexual offenders who are registered with the Sheriff’s Office can be obtained by residents of Boulder County by going to the Sheriff’s Office, Records Section, or one of the Sheriff’s Office Substations and presenting proper identification. If you are not a resident in Boulder County, you can also receive a copy of the list. The list changes on a daily basis, as new offenders register and registered offenders move out of the area. Photographs, as well as a brief description of the convictions requiring registration, are also available for viewing. If you are a sexual offender living in Lyons, Superior, or unincorporated Boulder County and need to register, please call 303-441-3611 and follow the instructions to set-up an appointment to register. You have five business days to get registered, once you become a resident. Our agency holds jail records for any person who was transported and incarcerated in the Boulder County Jail. We only have Boulder County Sheriff’s Office investigative reports, which will describe the arrest in more detail. Our agency holds reports detailing incidents and crimes reported to our agency. You will need to contact the investigating agency directly for their investigative reports. There is a $5.00 search fee for each searched report. The search fee includes up to 10 pages. Most reports fall within this range. If the report you are requesting is longer than 10 pages, each additional page will cost $.25. These fees are waived for anyone who is indexed in our report as a victim. If you wish to purchase an arrest photo (mugshot) of a person over the age of 18, there is a $5.00 fee. We cannot release arrest photos of juveniles unless that person has been charged as an adult. If this is the case, you will need to provide documentation from the Courts indicating such action. Dispatch tapes from the Boulder County Communication center may be requested from the Boulder County Sheriff’s Office. There is a fee for this service.